Home ♦ Coffee Shops ♦ Starbucks Card Mobile: Pay with your Phone! 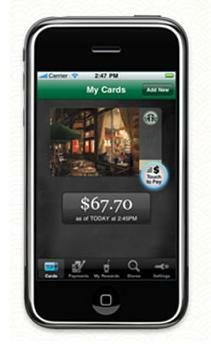 Starbucks Card Mobile: Pay with your Phone! Every time I’m in the grocery store, or any other store for that matter, I hear people complaining about how many cards they have to carry around in their wallets and about how many rewards programs they have to join. The Starbucks card is a little different because you can charge it up and pay for your coffee with it (not just use it to get a normal price on an overpriced box of cookies at the market), but it is still one more thing that you need to carry around with you. But Starbucks is going mobile with their cards and if you have a smart phone, you can download an app to access your card digitally. The app will tell you your balance and, when you press the button to pay, a barcode will appear that the barista can scan. Your bill will be deducted from your balance and you won’t need to fish around in your purse or wallet for yet another card (because we all know that we keep our cellphones handier than anything else, for the most part). I still like my Starbucks card (which is from 2001!) a lot, but I’ve used this type of system for airplane boarding passes and have to admit that it’s pretty convenient, so I just might end up downloading the app myself. It is currently available for iPhone and Blackberry, with an Anroid app coming soon.